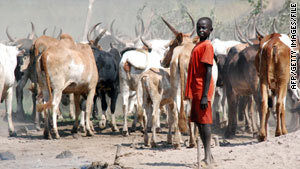 A boy rounds up cattle in a southern Sudanese settlement in the state of Jonglei. (CNN) -- Violence in southern Sudan has escalated to its highest levels since a 2005 treaty ended a 21-year-long north-south civil war, a leading aid agency has warned. In the first 10 months of 2009, Medecins sans Frontieres said, it witnessed a worrying deterioration in the region's security situation, resulting to severe medical humanitarian implications for the local population. The organization says the intensity of the violence in southern Sudan's Jonglei and Upper Nile states suggests a more disturbing trend than "inter-tribal cattle rustling." Villages, rather than cattle camps, it said, were often attacked, with women and children the majority of victims. In these violent clashes, 1,248 people were killed, three times more than were wounded. "The intensity of this year's violence has severe consequences," said Shelagh Woods, deputy head of mission for the group, also known as Doctors Without Borders. "We treat injured women who lost entire families, children with legs destroyed by bullets, people who fled without time to bury loved ones. People do not feel safe and live in constant fear of attacks." In addition to deaths, the flare-up of violence has resulted in the serious injury and displacement of thousands from their homes, which has led to outbreaks of diseases, such as cholera and malaria. In August, Lise Grande, the United Nations deputy humanitarian coordinator in southern Sudan, said that worsening inter-tribal conflict, an acute food shortage and a budget crisis had created a humanitarian emergency in the region, putting at least 40 percent of the population at risk. Grande said at the time that more than 2,000 people had died in inter-tribal violence and more than 250,000 people had been displaced across southern Sudan since the beginning of the year. In its report, "Facing Up To Reality: Health crisis deepens as violence escalates in Southern Sudan," the medical relief organization urges the international community to respond to the escalating crisis by shifting the focus from providing development aid to humanitarian emergency funds. "Violence is surging, plunging people from one disaster to the next. Yet immediate needs are not being met," said Stephan Goetghebuer, the group's director of operations for Sudan. "A better response to this growing emergency is crucial, or clinics will continue to run out of vital medicines, gunshot patients will still reach medical care many days after attacks and countless others will receive no care at all."